The pieces of my life that I choose to share. Well, I've had this site for just over a year now, but I stopped updating it, I got busy with life, new woman, work, kids, etc. So this just got pushed to the side. I had a few minutes today, so I'm updating it. Haven't done that since January of 2001. The site's name used to be Phill's Life, but I changed it to I'm Phillip. Kind of a twist on something my daughter says. If you ask her what her name is she says, "I'm Cameo" but the way she says it is sounds like, "UmCamyo?". It's cute, so I stole it, pronounce the name "Umflp?" and you'll have it right. So, you wanna know more about me, well here are the basics. I'm 27, engaged and divorced with two kids, I work for the Government (scary huh?) and I'm happier than I've ever been in my entire life. Here's some news from my area of the country. Enjoy! 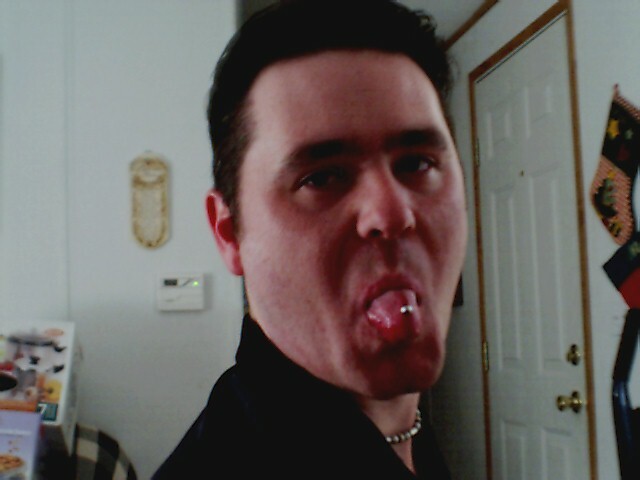 This is me with my pierced tounge. My ears are done now too, but this is an old pic.